Sandford is a rural village in western Victoria, 5 km south-east of Casterton on the road to Portland. It was named after the Sandford pastoral run taken up in 1843 by John Henty, a member of the Henty family which settled at Portland from Tasmania. Sandford township was surveyed in 1856, and for a few years rivalled Casterton in population and importance. It was the administrative centre of Glenelg shire for the shire’s first two years, 1864-65. A store and two hotels were opened in the year after the town survey and an Anglican school was opened in 1861. A Catholic church was opened in 1866. 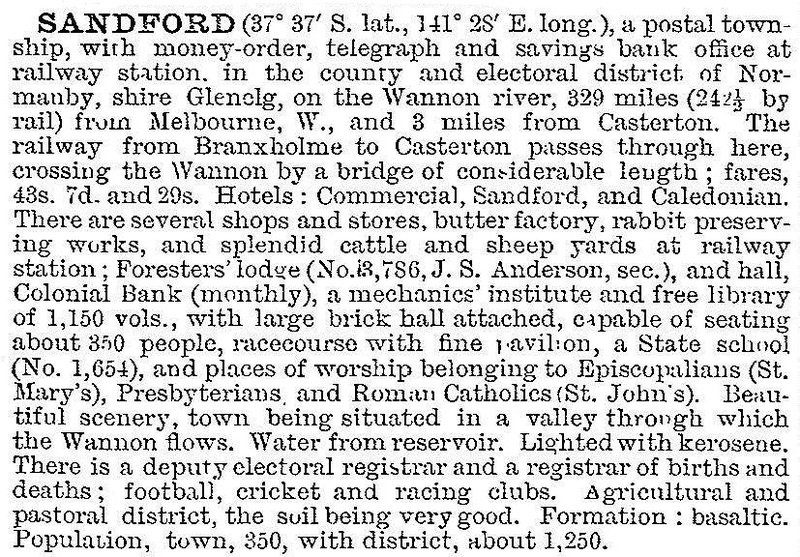 During the 1860s Casterton overtook Sandford, although both towns had flour mills from the early 1870s until 1889 when the Sandford mill was combined with Casterton’s. The Sandford building was used for rabbit processing. A Presbyterian church and a mechanics’ institute were opened in 1883 and 1885. Sandford’s proximity to Casterton ensured its eclipse during the coming motor-car age, despite the creation of soldier settlement farms after 1918. In 1933 the Victorian municipal directory recorded only one hotel and two stores; the butter factory and the rabbit processing works were gone. In 1963 Glenelg Shire’s centenary history recorded a school, two shops, a hotel, a public hall, two churches and 38 houses. At the 2011 census, farming accounted for 23.9% of employment.